Sean works in Christian ministry primarily among those many consider to be far removed from many church cultures. 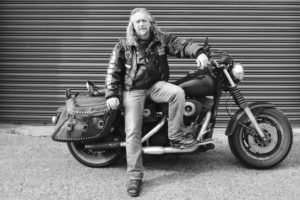 Much of Sean’s work has been among fringe groups including biker communities and associated groups, where he has operated in both a missional and a chaplaincy role – a role which has been hard earned over many years and many miles on the road. His work has also given him opportunities of speaking in mission gatherings, prisons and in a wide variety of mainstream churches throughout the UK and overseas – including Australia, New Zealand, Ukraine, Finland, Germany, USA and Holland. He was a regular contributor at Spring Harvest for many years and has previously been an associate of Youth For Christ and a supported missionary of Baptist churches in his hometown of Reading and also Swansea. Aspects of his work has been widely covered in the press over the years, including ‘The Guardian’, ‘The Independant’, BBC1, CH4, Scottish TV, BBC Radio 4, BBC Radio Wales and he has worked in conjuction with HTV on a TV series. Having been in Christian ministry since 1988, he was ordained in November 2002, by Rev. Dr. John Smith & the Leadership of St. Martins, in Melbourne, Australia, with whom he and Exousia Trust have had a long association. Sean has also been an Associate Missioner for Fresh Expressions. Sean is perhaps most familiar for founding and leading a pioneering church community in Swansea in 1998, called ‘Zac’s Place’ which continues to be an effective mission and discipleship based community of faith on the fringes among many marginalised people, with a chaotic but precious cocktail of bible teaching, the arts and service of the poor. He is also the founding President of the UK chapter, (1995), of God’s Squad Christian Motorcycle Club, (the first in Europe), which ministers primarily among ‘outlaw’ motorcycle clubs and was established in Australia in the late 1960’s where it is still thriving – Sean also served as International Vice-President having also previously been the club’s founding European President and remains active in the South Wales chapter. In 2014 Sean established Rough Edges in Swansea. This is a social enterprise including a ‘charity shop for blokes’ and workshop in support of Zac’s Place. Sean is originally from Reading, Berkshire but has lived in South Wales for many years with his wife and four children.